I have some bad news: it’s unlikely that we’re going to be seeing a robot apocalypse akin to the one that sets off the events of Horizon Zero Dawn. So the chances of you becoming as badass as Aloy are rather slim. But don’t worry! There are tons of goodies out there to make you feel like you’re in the lush post post apocalyptic world that our razor-sharp Seeker inhabits. From hoodies that would even keep you warm in Horizon Zero Dawn: The Frozen Wilds, to statues you can gaze over your morning hot beverage, here’s the best Horizon: Zero Dawn merchandise around. Perhaps 10cm tall is too high for your liking. Perhaps you want something discreet to carry around in your bag or hold in your hand for good luck. 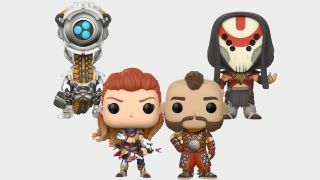 Whatever logical reason you could have for wanting an even smaller Horizon figurine, Funko yet again has you covered. These small characters stand only three inches tall and you can choose between robots, heroes, or villains. Just in case you understand where Helis was coming from. Or you might want a reminder of the raw power of the Thunderjaw (and a sly reminder of how many times Aloy got trampled by it). Either way, Funko Minis will keep you guessing as it’s pure luck which figurine you unwrap - so why not roll those dice? It’s a daily tragedy that we can’t wear the glorious outfits sported by the Banuk, Carja, Oseram, or Nora. But until the days come where wearing tribal robot-armour is the norm, this t-shirt will have to do. Aloy’s majestic figure is painted on the front, wielding her bow in preparation for any machines that should stumble her way. It’s made of cotton so it’s sure to be comfy no matter the weather, which is more than we can say for the heavy outfits worn by the people you meet in Horizon: Zero Dawn. No, you can’t fit any shards in here as this wallet is made for the slim, paper banknotes we prize in today’s society. It would definitely look ungainly if it was big enough to fit in the undoubtedly heavy metal shards Aloy carries around, so perhaps we should be grateful that we can get our hands on the lighter, slimmer version. The heavy stitching makes it look like it was crafted by the Nora themselves. Made of faux leather, if you close your eyes you could almost believe that it’s the product of the boars that you hunted throughout the Embrace. Almost. Spending even 60 hours in Aloy’s world isn’t nearly enough. After all, the thought put into designing everything ranging from deadly robots, poignant ruins, to fascinating cultures is palpable. Luckily for all of us who appreciate of the finer things in life, The Art of Horizon Zero Dawn exists. The illustrations inside give us a glimpse into the process that created the game, delving even deeper into how our favourite characters and robots evolved into the things we fight alongside or against in Horizon: Zero Dawn. Simply put: the illustrations inside are super pretty. Some people value simplicity. Understated style. Minimalism. This statue isn’t for anyone like that. Dedicated to immortalising Aloy in glorious PVC, the attention to detail is astonishing. No wonder, as it’s been designed from the same digital files that bring Aloy to life in the game, meaning that it’s the closest you’re going to get to a real-life Aloy (sorry, cosplayers). There’s shading on her brightly-coloured Nora outfit, right down to the tiniest details in the stitching and the feathers tied to her bow. The bowstring is even elastic so you can ping it and feel like you have a slim understanding of what it must be like to fire out arrows with devastating accuracy. Kinda. There really is something for everyone here. Not a fan of statues or Funkos? Try a plushie! Soft, cute, and most definitely not a choking hazard unless you’re a Sawtooth with a massive mouth, Aloy in squishy form just looks a tad too adorable to imagine with a bow or spear. The sight of which, standing at the foot of your bed at night, is quite terrifying to contemplate. She’s about 6” tall, making her perfect to put alongside your PS4 if you need something calming to look at after being massacred by a Frostclaw again. Not all of us can wear Rost’s heavy boar skin cloak when it gets chilly. Not least because the sight of a dead boar on your shoulder is enough to make your office colleagues freak out and probably ring the RSPCA. Instead, if you want to keep cosy in the winter months try this hoodie on for size. Even better, it’s a pale beige so it blends into the undergrowth. Perfect for when you’re practising with your spear and bow in your back garden in preparation for the apocalypse. Complete with beads and that Nora hand-stitched look, Aloy would probably be sporting it herself if she stepped out of your PS4 into this dimension. After she tries to shoot your Roomba with her bow. You’ve got your t-shirt. You’ve got your hoodie. Hell, you might even have a custom-made focus in your ear, ready to highlight any robots (or car parking meters - probably similar enough) in the distance. But what don’t you have? A bag. This Horizon: Zero Dawn messenger satchel solves that problem though, and looks perfectly authentic to boot. Padded with a bright red interior and emblazoned with the Horizon logo on the front, it’s 33cm wide, 37cm high and 6cm deep, big enough for your laptop. Or your hoard of metal shards. Whichever one floats your Snapmaw.